While pursuing a Master’s in Geography, Keelin Haynes also carries out research in the department’s Geospatial Analysis Center. Through the Center, he focuses on identifying and solving spatial problems including wildfire risk models, agricultural crop yields, and ecological forecasting, among other topics. 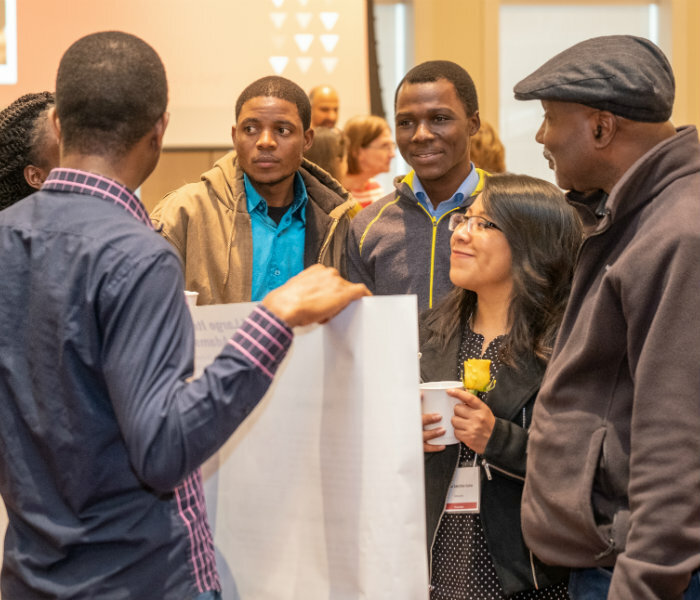 The work presented at the Graduate Research Forum was funded through a NASA Land Cover- Land Use Change grant focusing on predicting increased future flood risks and the impact that it could have on local agricultural production. His study area, the Mekong Delta region of southern Viet Nam, has seen steady and substantial ground subsidence over the past few decades and is projected to continue this trend in the coming years. This lowering of ground elevation is causing normal yearly flooding to expand past its previous boundaries and is posing a risk to the substantial rice paddy agriculture. Given the region’s mass production of rice and its importance to the global market, any risk to its crop yields requires serious action. Keelin analyzed a variety of satellite data from NASA and NOAA, including elevation data, multispectral imagery, and global cropland data using a combination of commercial and open source coding software. He was able to identify over 100,000 hectares of current agricultural land that is at potential risk for increased flood inundation. These results will be used to develop more extensive models of land cover and land use change as part of the larger NASA grant. Keelin started his undergraduate career at Miami in political science, with a focus on institutional development and political stability. 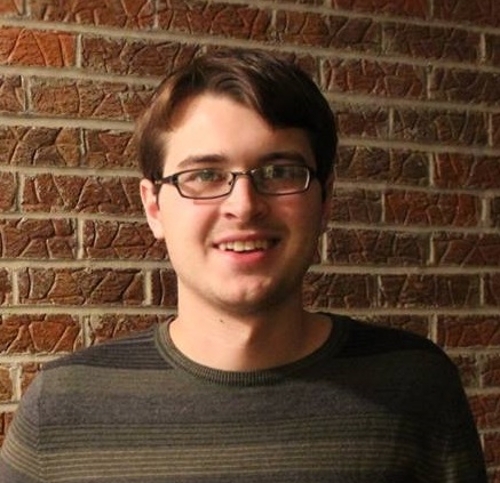 Through his undergraduate research, he gained a large amount of experience using various geospatial techniques and software. This influenced his decision to pursue a Master’s in geography as it would allow him to combine his knowledge of political development and government institutions with advanced geospatial technology and hands on field experience. Keelin will be continuing his research into the Mekong Delta, its people, and institutions with several weeks of field research this summer in Viet Nam and plans to use the funds awarded from the Graduate Research Forum to help pay for his research expenses while abroad. 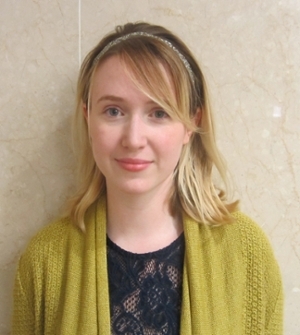 Elizabeth is currently a second-year graduate student pursuing a doctoral degree from the Department of Psychology working in Dr. Anna Radke’s Reward and Addictive Disorders (RAD) lab. Her first exposure to neuroscientific research was working with transgenic rats investigating spatial memory and how it’s affected by degenerative brain diseases such as Alzheimer’s Disease. Elizebeth's interest in neuroscience grew during this lab, furthering her education in addiction neuroscience at Miami. Broadly, Elizebeth's interest is in brain systems which control our behavior, how substance abuse can alter these brain systems, and the neural networks associated with behavior. Currently, she investigats the neural substrates of motivation and reward of addiction in a mouse model using multiple alcohol models to study binge-like and compulsive-like alcohol drinking behaviors, developing a deeper understanding of this behavior, which is a characteristic of Alcohol Use Disorder in humans. Elizabeth hopes to develop a deeper understanding of the neural mechanisms associated with this behavior to expand the research to investigate the neuroplasticity of alcohol addiction during key phases of the addiction cycle. Masoomeh Kousehlar is a PhD candidate in the Department of Geology and Environmental Earth Science. She received her B.S. and M. S. in geology from university of Tehran, Iran. Masoomeh is investigating the air pollution in urban and industrial area using a combination of geochemical and microscopy techniques. She uses tree bark and lichen as biomonitors of air quality. These biologic materials are excellent tools for estimating the levels of toxic metals in the atmosphere and determining the source of atmospheric particles. She analyzes these samples for their elemental compositions and isotopic ratios to identify and characterize the sources of air pollution and the degree of atmospheric metal contamination in areas with limited environmental studies. The techniques developed in her research can be applied globally for identifying the sources and extent of air pollution, which is crucial for implementing effective controlling strategies and lowering the risks. Md Rashef, is a final year Mechanical Engineering graduate student at Miami University and has worked on various research projects concentrated in the manufacturing field. Md Rashef's final thesis project is a collaboration between the mechanical engineering and biology department named as “Investigating the Biocompatibility of Ti-6Al-4V Machined by Wire Electrical Discharge Machining Process”. Last year, he presented his thesis at the graduate research forum which was a great experience to explain his research topic in front of a non-technical audience, which is not very easy, especially when dealing with some core-scientific research involving biomedical implants. Md Rashef was happy to try to connect with the audience with some humorous input and was announced one of the best presenters on the forum. The forum also works as an amazing platform to connect with grad students from different departments of Miami. Md Rashef is currently finishing his thesis and hopes to start a PhD next August. 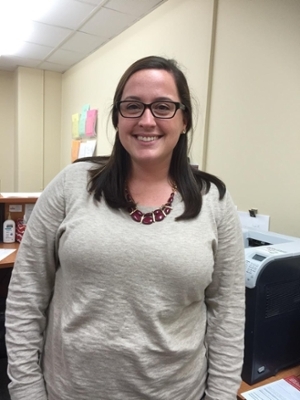 Brittany is currently pursuing a doctoral degree in the Department of Geology and Environmental Earth Science at Miami. At the crossroads of geology and materials science, her research explores natural mineral structures with useful physical properties, such as high thermal stability and charge transfer capacity. Her intent is to experimentally modify them and enhance those properties. When people ask Brittany what she does, she often responds, “I make Franken-minerals.” She is interested in finding and pushing the limits of what is possible at the atomic level. Brittany finds the natural world to be an excellent laboratory that builds exotic structures that can be explored and optimized for industrial use. In her dissertation research, she is synthesizing analogues of known or suspected catalytically active, manganese-rich minerals, through a variety of mechanisms, enhancing their physical properties through the introduction of certain rare earth elements with the ultimate goal of lowering energy barriers for industrial chemical reactions. Holding both bachelor’s and master’s degrees in geology, she is contending with new challenges by getting involved in materials science for her doctoral research. But enjoys these challenges of learning on the go, and hopes to bring a fresh perspective to the field. 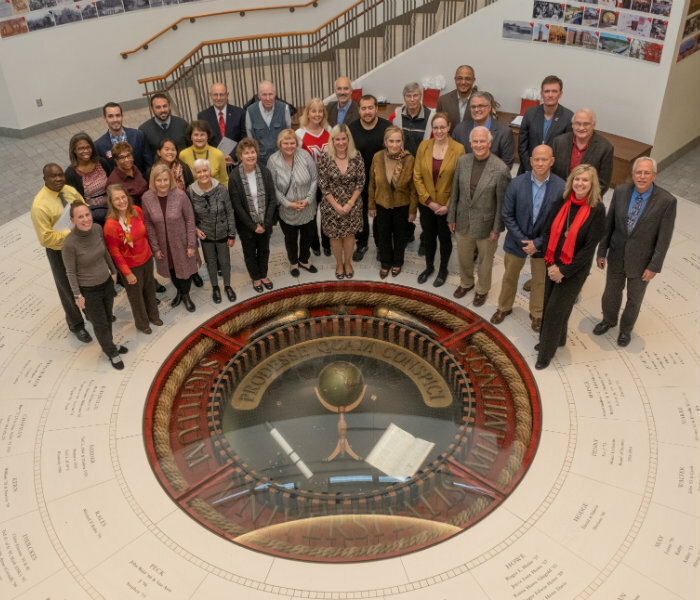 She credits her progress to the abundant hands-on training opportunities in analytical instrumentation at Miami University, bright colleagues and mentors to discuss ideas with, and support from my advisor, Dr. Mark Krekeler. The Miami community provides Brittany with helpful guidance, motivation, and the freedom to make productive mistakes as often as she needs. She plan to use the award money to attend the Materials Science and Technology conference in Portland, Oregon this fall to present research regarding one of her dissertation projects. While pursuing a doctoral degree from the Department of Geology and Environmental Earth Sciences in environmental isotope geochemistry, Masoomeh Kousehlar used isotope geochemistry to find the sources of lead and other toxic metals in tree bark. In doing so, she hopes to determine whether pollutants in the Iranian capital city of Tehran and other areas were manmade or natural, and how this pollution could be improved. First, she traveled to Iran and gathered tree bark samples from 30 locations around the city. Using tree bark made sense to Kousehlar, as trees have been in the same area for years, trapping materials from many different sources, both manmade and natural. The trees act as a sort of “dust filter” or biomonitor. After drying the bark at 550 degrees overnight and “ashing” it down, the ash was ready to be dissolved with nitric acid and analyzed by inductively coupled plasma mass spectrometry (ICP-MS) to determine how much of each metal each sample had. Using thermal ionization mass spectrometry (TIMS), Kousehlar was able to analyze the lead (Pb) isotopic composition of each sample and determine the sources of metals at each location. Examining these pollutants continues to be an important topic for Kousehlar, as knowing the source and extent of pollution in an environment can help in the implementation of more effective methods to reduce pollution and lower the risks. Creating positive environmental changes can be extremely difficult in developing countries. However, she hopes her research will help convince policymakers to install filters and/or take other actions to improve the air quality in Tehran. After she completes her degree at Miami, Kousehlar hopes to return to Iran and pursue a career in academia. 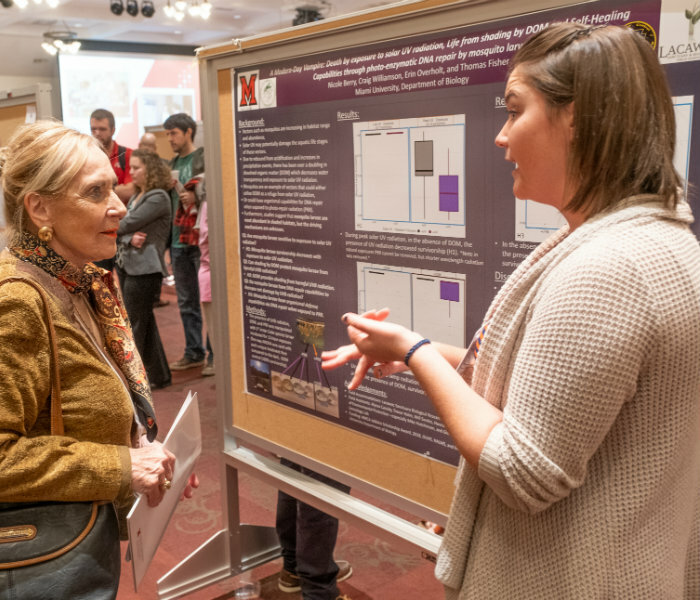 For her, “the feeling of giving knowledge away is rewarding.” Using the award she received at the Graduate Research Forum, she plans to travel to the Geological Society of America’s annual conference, held in Seattle, WA. Interested in determining how individuals with gambling disorders regulate their impulse control, Danielle Tapp, pursuing a PhD with the Miami Department of Psychology, administered oxytocin-- a social hormone-- directly into the brain of rats to assess their risk behavior. Though her experiment involves rats, she hopes to gain a better understanding of the relationship between this social hormone and human decision making. By using an animal model to address risky behavior such as gambling, Tapp wanted to determine if varied doses of oxytocin would alter both the decision making and disposition of the test rats. The rats were given the option to “gamble” for sugar pellets. They could either choose a smaller, certain reward or try for a larger, riskier reward. The behavior was recorded based on rats given varied doses of Oxytocin or a placebo, and this data was used to determine whether the dosage would make the rats engage in fewer or more risky behaviors. Upon completing the pilot data, Tapp found the results somewhat surprising. The subjects’ behavior did not change obviously or immediately as expected, though the rats completed enough trials and liked to gamble. However, Tapp plans to reevaluate the experiment to use a more specific reward method and to better understand the choice behavior. With the money she won at the graduate research forum, Tapp is looking into several different options to advance her professional career. She is interested in some short courses, including a methods course to aid her in data collection. She also hopes to attend the Society for Neuroscience’s annual conference to listen to some of the most established scientists in the field discuss their own work. Pursuing a doctoral degree from the Miami Department of Biology, Joseph Baumgartner wanted to understand not just how species responded to climate change, but to understand the effects of climate change in the Michigan area. He started studying the movement patterns of the Peromyscus leucopus, a species of mouse, and how the creatures moved north, noticing what environments allowed them to travel faster or slower. This research will determine how the mice were able to quickly colonize large areas of new territory. For Baumgartner, learning new technologies used to examine the data was challenging. Additionally, the project required him to incorporate a wide variety of shape and genetic information to determine how the populations persisted in the new territory. This work is particularly important in understanding how animals move throughout their environment, which is influenced by climate change. Various species must continue to adapt and adjust to their environments in order to survive in ever-changing habitats. However, this also presents a challenge for humans as well. As the environment changes, we must also study how human populations will be affected by the movement of mice. Peromyscus leucopus is a vector for various diseases such as Lyme disease or Hantavirus, and some human populations may have never been exposed to these before. Baumgartner hopes to defend his doctoral dissertation in May of 2017, and complete his degree in August. He then hopes to move to a tenure-track position at a smaller university in Ohio and feels that teaching at a school with a small student body will give him the opportunity to really make an impact on his students. He plans to use his money from the Graduate Research Forum to sequence the remainder of his genetic data and purchase textbooks before beginning his teaching positions. 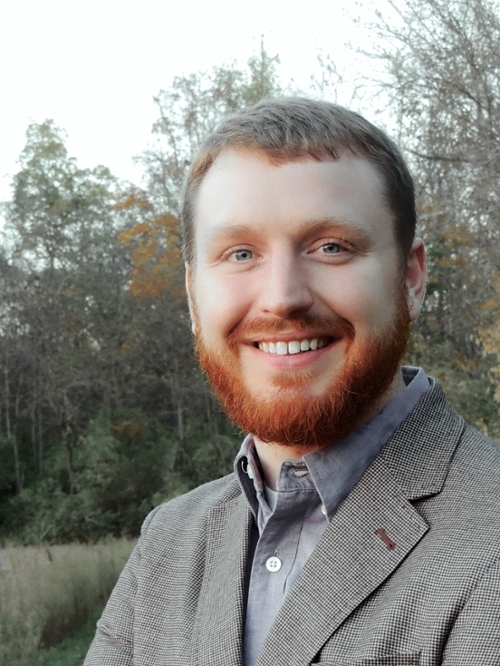 Pursuing a master's degree in History from the Department of History at Miami, Jake Beard has always been interested in the philosophy of madness and Russian Imperial history. With these diverse subjects in mind, Beard’s research, titled The True Biography of a Madman, allowed him to combine these two passions and examine the life of one of the most influential Russian thinkers of the early eighteen hundreds. As a critic of the Russian government during Nicholas I’s regime in 1836, Pyotr Chaadaev published his controversial work the First Philosophical Letter in the Russian journal Teleskop and was subsequently deemed mentally insane and placed on house arrest.While philosophy always piqued his interest, Beard excelled in his historical studies and cherished the feeling of succeeding in academia. This success bolstered his love of history, and challenged him to find a blend of his areas of study when beginning his graduate degree.Chaadaev’s unique story presented a challenging but rewarding opportunity for Beard. As a historian, he was tasked with reporting and commenting on the conditions surrounding Chaadaev’s life and thought while struggling to assess the mental state of a subject whom he would never have direct access to. As an academic, it remained extremely important for him to avoid speculation or irresponsible conclusions. Additionally, years of studying modern Russian only moderately prepared him for primary source analysis of documents predominantly in French or composed in Imperial Russian orthography.When not doing work for his degree, Beard enjoys taking his brain to “the lowest possible brain wave” by watching television and relaxing. As he continues his research, he plans to use the money awarded to him from the Graduate Research Forum to purchase more reading material, as a historian’s reading is never truly completed. Jeffrey Brock is pursuing a master’s degree in the Department of Physics and his thesis research is titled Keeping it Cool: New Materials for Energy Efficient Refrigeration. 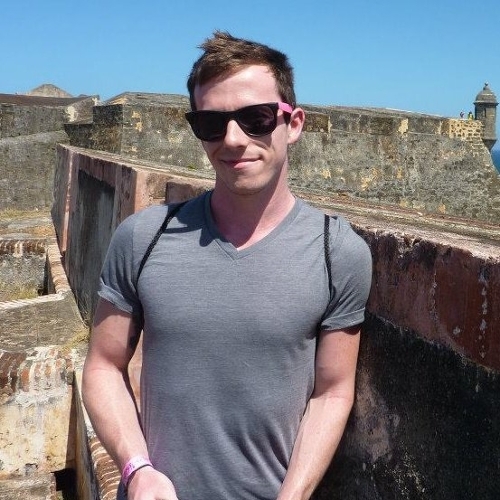 Brock began conducting research during his undergraduate years at Miami, studying a phenomenon known as the Magnetocaloric Effect (MCE) - a phenomenon which may lead to improved efficiency in refrigeration processes. Succinctly put, the MCE is an inherent behavior of all magnetic materials by which a change in the magnetic state of a material leads to a heating or cooling effect. The processes governing the MCE exhibited by a material are intimately related to the constituent elements and their relative proportionality; thus, by combining elements to form new compounds, the magnetic and MCE properties can be tuned. By tuning these properties, Brock hopes to maximize the MCE to work efficiently under certain situations, including at room temperature. Air conditioning and refrigeration are attractive areas to target for improvements, as current technologies are notoriously energy-inefficient and utilize greenhouse gasses that contribute to global warming. For Brock, the process all contributes to what he calls “physics with a purpose,” which involves using physics to solve problems in the real world. He has been dedicated to this cause since he began this research his junior year as an undergraduate at Miami, and loves the work he does because of its potential impacts. 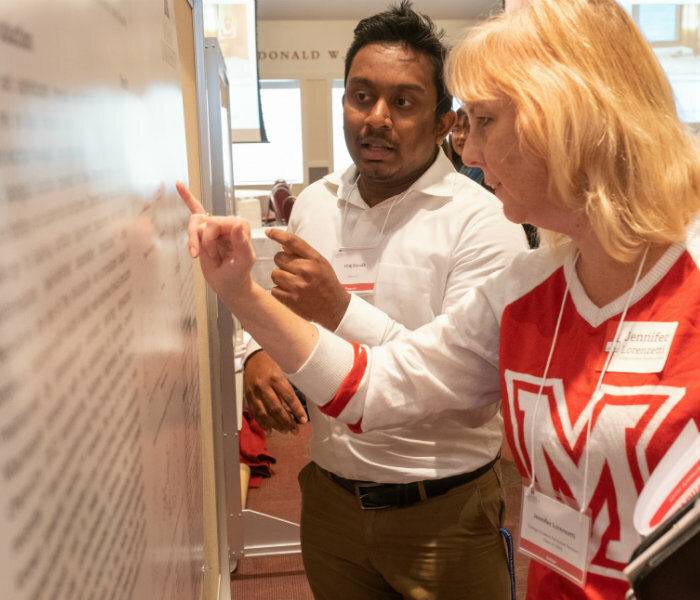 Brock credits his undergraduate experience at Miami for igniting his passion for research and facilitating connections between what he learned in the classroom and real-world applications. After finishing up his graduate work at Miami, Brock hopes to enter a doctoral program in materials science or physics. With his winnings from the Graduate Research Forum, he plans to attend the American Physical Society’s March Meeting in New Orleans. At this gathering of more than 10,000 physicists, he will give an oral presentation regarding one of his MCE-related projects. Working with acid mixtures might make a lot of people uneasy, but doctoral student Ashley Richardson has based her entire research project around working with these substances and developing a new method for separating them using chromatography, or “separation science.” With her research, Richardson hopes to create a method that can be used by industries, particularly the food and drug industries, to separate aromatic acids and create safer mixtures for consumers. In her experiments, she works primarily with a mixture found in fruit juices and wines that have not been separated before. In her method, Richardson uses a type of chromatography called HILIC (hydrophilic interaction liquid chromatography) to separate the mixture. In this process, the mixture is injected into a narrow column that is packed with very small particles. Then a liquid is added, causing the aromatic acids to interact with the small particles. Each acid interacts differently with the particles and the liquid, causing each one to move through the column at a different speed, eventually separating the mixture. Richardson is also able to change the make-up of the liquid and alter how long it takes each acid to separate. Since her method is very tunable, she can change parameters to affect the retention of aromatic acids and separate two components that are structurally similar. This could be useful in pharmaceuticals, she explains, because “one form [of the mixture] is toxic to the body and one form is the drug itself that will help.” Her method will help developers more easily reach that optimal separation. From an early age, Richardson knew that science was her passion. In her undergraduate career, she was exposed to many types of chemistry, but it was analytical chemistry, specifically chromatography, that made the most sense to her and became the field she chose for further research. In addition to her research, Richardson is a teaching assistant for an analytical chemistry course at Miami and oversees several instruments in the chemistry department, where she runs samples for other student researchers. She is also very involved in her church, Oxford Bible Fellowship, where she serves on the worship team and volunteers her time in the preschool. After receiving her degree, Richardson plans to remain in the chromatography field and work in industry, hopefully utilizing her method in future research. She plans to use her prize money to cover travel expenses to the annual analytical chemistry conference, Pittcon, in Atlanta this March. 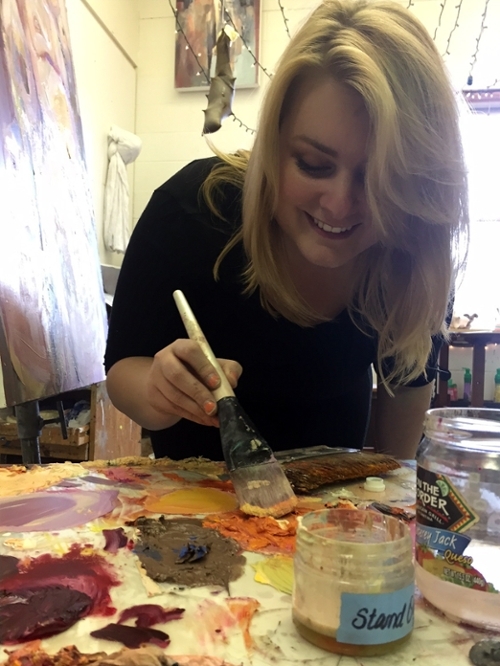 Many artists find inspiration in the world around them and Megan Taylor is no different. She began focusing on the body in her artwork because she was compelled to respond to stories of other women and their struggles with abuse and assault. When she heard stories of other women, be it in-person or on the news, Taylor was able to connect her own personal experiences and use those feelings to influence her art. Her current work can be described as an exploration of the body. Taylor explained that she had always been interested in the body, especially the female form, and after the birth of her child, she became more aware of the body, inspiring her work. She explains that her work “stems from reactions to both the beauty and brutality of human experience.” Her paintings are not literal representations of the body, though. In her undergraduate career, Taylor’s work was highly sensual and more graphic, but when she came to Miami, her work dramatically changed. She realized that all of her undergraduate work had really been about herself and not just the stories of others. This epiphany inspired her to do a more personal exploration of the body, prompting her to create her new series. With each piece she creates, Taylor does a visual study, looking at the works of other artists to inspire her own. Currently, she has found inspiration with artists such as Cecily Brown and Jenny Saville, who she greatly admires for their work with the female body. She also takes inspiration from other images of the body and uses these visual representations to begin her work. From these images, Taylor creates her paintings, often starting with a drawing that she paints over and abstracts. She describes her painting style as “aggressive,” using thick coats of paint that she continually changes by adding or scraping away. For Taylor, this project is a very personal one. It is truly an expression of herself and she sees her art as something with the power to connect people. In the exhibitions she has had, Taylor has seen a strong reaction from women. She explains that the emotions involved in our experiences connect us and her art helps to bring out those emotions. Beyond this project, she has aspirations of getting her art exhibited but is also interested in teaching. She currently teaches a figure drawing class at Miami and enjoys being outdoors in her free time. Many may not be familiar with Chile’s Atacama Desert, but doctoral student Race Workman has spent nearly two years researching the area to find new ways to combat drought in the driest place on earth. As an undergraduate student at the College of Wooster, Workman double-majored in archeology and geology and developed an interest in how climate has influenced cultures over time. Once he arrived at Miami, he was able to turn that interest into a project where he works to reconstruct climates of the past in the Atacama Desert. Workman’s project focuses on looking at the climate of the Atacama over the last 2500 years and linking the depletion of water resources to past events. In order to understand why the water supply in this region continues to drop, the effect of humans in the area must first be understood. Workman’s models allow for a comprehensive look at the region before and after human influence. In doing so, he is able to understand the water resources in the Atacama and help the people living in the region determine how best to conserve the limited resources they have left. He also explained that his models could be used by any number of organizations looking at water resources in the Atacama Desert, making them an important development for conservation practices in the area. Throughout his research project, Workman spent two and a half months in Chile working with archeologists and paleo-botanists in the Atacama and plans to return to the area this summer. He has also presented his research at several conferences and continues to further develop his findings. After he receives his degree, Workman hopes to find a job in academia or potentially start his own geotechnical consulting company and use his lab skills to consult for environmental firms. In the meantime, you can likely find him racing around campus with the Miami Running Club when he isn’t busy running samples in the lab. Being able to visit southern Florida and the Bahamas for thesis research sounds like a great opportunity to most students. For Patrick Garret, having the opportunity to visit these “hotspots of biodiversity” andwork to save the Canella winterana plant from extinction was a dream come true. “Plants are really, really cool!” Garret explained. “It’s important that we make sure we have as many on the planet as possible.” With his research project, he aims to make that a reality by researching pollination patterns for the Canella winterana plant and deciphering how animals are currently moving the pollen throughout the environment. From there, he can use those patterns to start developing better reproductive strategies for the plant to save it from extinction. Canella winterana is also known as cinnamon bark in the region and is used by many cultures in the Bahamas. The plant can be used for a variety of purposes, such as a toothache treatment or a spice, making it a very important resource to save from extinction. This research is not only important to the Ecology community, but also to Garret himself. “I was the type of kid who wasn’t supposed to go to college, and definitely not graduate school,” he explained. “I was about to drop out of college when I began studying plants with a professor and it completely changed my life!” Because of his passion and experiences, Garret now focuses on teaching and communicating his research to get others excited about science. In fact, he hopes to one day pursue a career in academia and become a professor so he can inspire people the way he was inspired. He also hopes to be able to visit the Bahamas in the summers to teach courses. In addition to his career aspirations, Garret hopes to eventually go back to the Caribbean region to help the Bahamas and other nations develop endangered species lists. Outside of his research and academic pursuits, Garret has many roles, including being a father and burgeoning musician. In his spare time, he enjoys playing piano and guitar, expanding his vinyl record collection, and teaching his eight-year-old son about plants. To find the answer to this question, Mullins compared the grade outcomes of economics students in their major courses to the student’s exposure to higher-level math courses. He explained that there is wide variance in economics curricula throughout the country and he hopes that his findings can serve as an informative resource when universities are determining their economics curriculum. From his research, Mullins determined that requiring students to take courses up through at least the college algebra and pre-calculus level was most beneficial. Further, he found that taking more math classes is most beneficial to economics students when they reach macro- and microeconomics courses. Upon arriving at Miami, it was his personal experience and a little good luck that brought Mullins to this project. After he finished his undergraduate studies, Mullins worked with a research group where he was working on projects similar to his current research. Because of this experience, he was able to get connected with another university and gain access to student-level data, leading him to the project he presented at the Graduate Research Forum. With his winnings, Mullins plans to travel to the Missouri Valley Economic Association Conference to possibly present an update on the paper. After receiving his degree, Mullins hopes to pursue a Ph.D. in statistics or decision science, but for now, he is staying very busy at Miami. When he isn’t working on his research, he can be found teaching a course in finite mathematics or assisting in the Mathematics undergraduate capstone course. 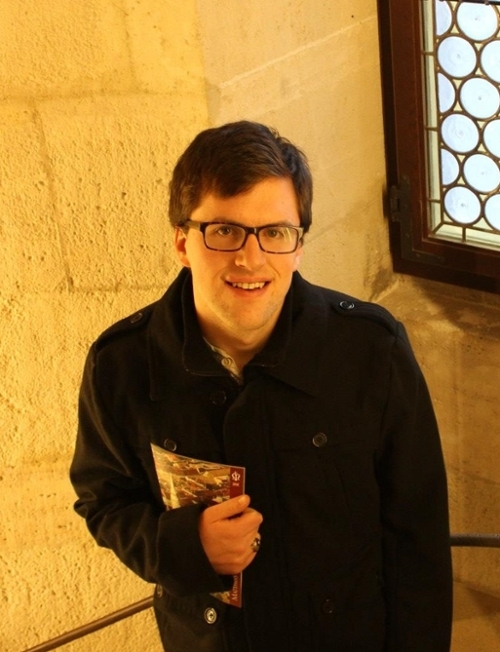 As an admirer of the theater with a background in History and English, it makes sense that Clint Rodgers chose to focus on early modern theater in England and the attacks by the clergy for his master’s thesis. In this project, Rodgers examines how the overly sensual nature of the theater became the main reason that the theater was attacked in the early modern period. Additionally, he argues that many who spoke out about the theater in that time did so for religious reasons. In his undergraduate studies, Rodgers double-majored in History and English and was very involved with the theater department at his university. He also had an interdisciplinary minor that allowed him to combine these interests and study theater and morality plays. In doing so, he performed close readings of the texts and put them in historical context. 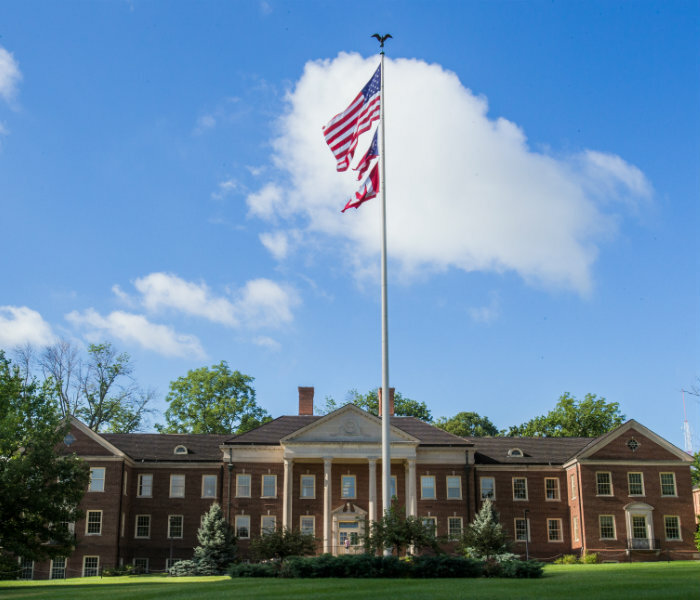 When he arrived at Miami University, Rodgers learned more about the concept of the senses within theater and decided to add a new component to his previous research interest. Currently, no studies exist that examine the relationship between these anti-theatrical texts and religion, so with his research, Rodgers is trying to make a larger connection between the two. This is an important development within the history field because it takes a new perspective on a topic that many have studied in the past. With his findings, Rodgers hopes to add to the conversation that early modernists are having about the senses. He also hopes to help people better understand the cultural impact of the theater on the history of multiple civilizations. Now that his degree program is winding down, Rodgers is deciding on what comes next. He debated on applying to a Ph.D. program but decided to hold off for next year. Instead, he is interested in teaching positions or a job in public history with a museum or other organization. He hasn’t left his research behind, though. In January, he used the prize money from the Graduate Research Forum to travel to Chicago and attend the 2016 Multidisciplinary Graduate Student Conference at the Newberry Library in Chicago. While there, he presented a new part of his research paper. Outside of his academic pursuits, Rodgers enjoys researching his family history and doing some creative writing. He is also involved with a church in the Dayton area, where he serves as a youth ministry program volunteer.